The Qualcomm Snapdragon 855 (or SD 855) chipset is likely to feature in numerous new flagship mobile devices this year. So far, however, the closest many reviewers and tech journalists can get to it is if it is incorporated into a reference device. These are generic phones or phablets intended to showcase the essential properties of each new chip. So far, Android Central and XDA have gotten their hands on one containing the SD 855. They put it up against varying amounts of other leading processors in a battery of benchmarks. They have found that the SD 855 is already demonstrating superiority over them in certain different ways. Both of the media outlets in question compared their devices using Antutu Benchmark (v7.1.1) and the components of Geekbench 4. 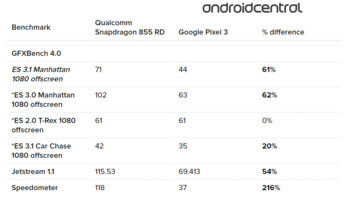 XDA's process compared it to the preceding Qualcomm flagship, the Snapdragon 845, in the form of the Pixel 3 XL. This outlet also did the same using the Honor Magic 2, which is powered by the Kirin 980. Android Central used the Pixel 3 as its SD 845 competing device, as well as the Apple iPhone XS for its A12 Bionic chip. The results of the latter phase of testing showed that the SD 855 device had outdone the XS in terms of Antutu scores, but only by 7%. The new Qualcomm chipset fell down in CPU terms (falling behind the iPhone by 6.82%), but overtook it in GPU and UX terms (by 20% and 13% respectively). The XS did beat the SD 855 in Geekbench 4 scores, by 27% in single-core terms and 2.56% in multi-core terms. But what about the SD 845? Android Central reported that the 2019 chipset had destroyed its predecessor in nearly all dimensions, beating it in Antutu by 52% overall, and by 49% and 42% in Geekbench's single- and multi-core tests respectively. However, XDA's results were inconsistent with these findings, asserting that the SD 855 had beaten the Pixel 3 XL by only 24% in Antutu, and by 48% and 35% in Geekbench single- and multi-core scores respectively. 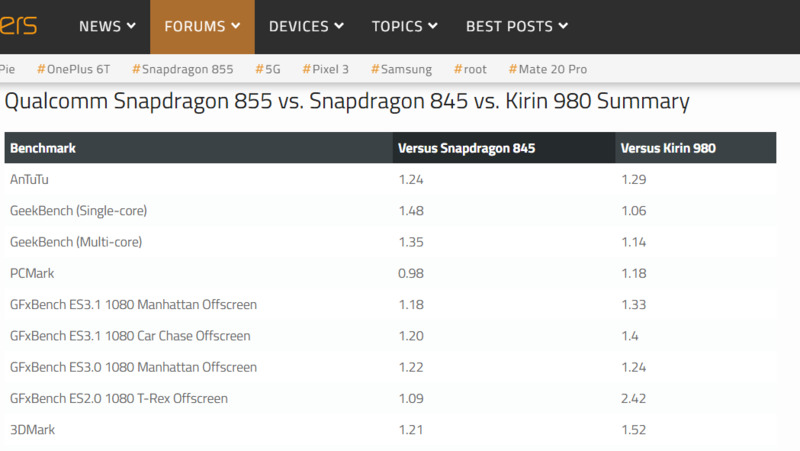 The SD 855 did not do as well against the Kirin 980 in Geekbench terms: it got only 6% better single-core scores and did 14% better in multi-core terms. The newer processor also outdid Huawei's 2018 CPU flagship by 29% in Antutu benchmark scores. The story gets slightly more complicated from there. 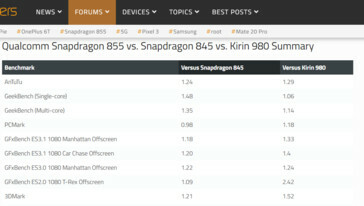 Both Android Central and XDA also posted the various processors' GFXBench 4.0 scores. Here, the two reports only agree on the difference between the SD 855 and the SD 845 in ES 3.1 Car Chase 1080 offscreen: 20% in favor of the newer CPU. The rest of these tests have returned wildly variable results between the two outlets. This may be because of slight differences in the devices and testing methods used in both reports. In any case, the performance of the SD 855 - especially in comparison to the 845 - is looking exciting even at this early stage. We can't wait to confirm these results for ourselves.